Well, my first game jam was definitely a blast. I was definitely surprised when our team was announced to be one of the finalist I was thrilled. But ultimately, the winning definitely did an excellent job and truly deserved it. The game jam criteria is simple. 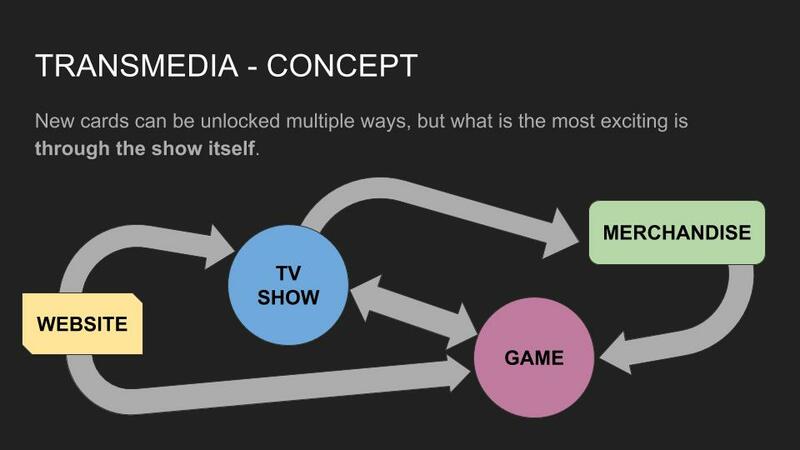 Create a mobile game for kids based on an unreleased TV show. Immediately I knew, for the game to stand out, some form of transmedia needs to be incorporated. I always believe that sometimes games based on other mediums are usually poorly received because the connection to them is quite lacking. Game will often borrow elements from other medium, instead of completely weaving the experience into a cohesive package. Compare the Batman games from the Arkham series and you can see why it is one of the best superhero games out there. You really feel like the freaking Batman. No other game has come close. Also it manages to weave to much of the lore into the game, with easter eggs for comic fans, voice acting for the animation fans, and engaging combat for the film fans. The Ejen Ali Game needs to connect the TV show to the game itself in a meaningful way. Therefore the first thing is to find a connecting point. I reference Pokemon because it is in my opinion designed from ground up to be transmedia. The game, the show and even the card game are so intertwined that it’s reach is exponential. And what is the connection? The Pokemons. Let me give you an example. I play the game, with Squirtle (a water Pokemon) as one my line up. I encounter a Pikachu for the first time (an electric Pokemon). During battle the Pikachu performed an attack which killed Squirtle in 1 hit. As a kid, you are devistated. Why is this creature so powerful? Come 7pm and the anime comes on. I see the same thing happen, a Pikachu easily beating up water Pokemons. Then something happended, the character switches Sqirtle out and replaced him with an Onyx (a rock pokemon), the battle is one sided, as electricity has no effect on rock types. See what happened? The show thought the players and viewers about strength and weaknesses, which is immediately translatable to the games. Since Ejen Ali is a kids version of a spy thriller, so we are quick to settle on an isometric grid based strategy game. For the connecting factor, I decided to focus more on the gadgets that he uses. To make the gadgets tie in to something physical, we can do it with either merchandising, or cards, which is a cheaper alternative. Going with cards opened up lots of possibilities with distribution and presentation. It works well with mobile and works well as a physical product. 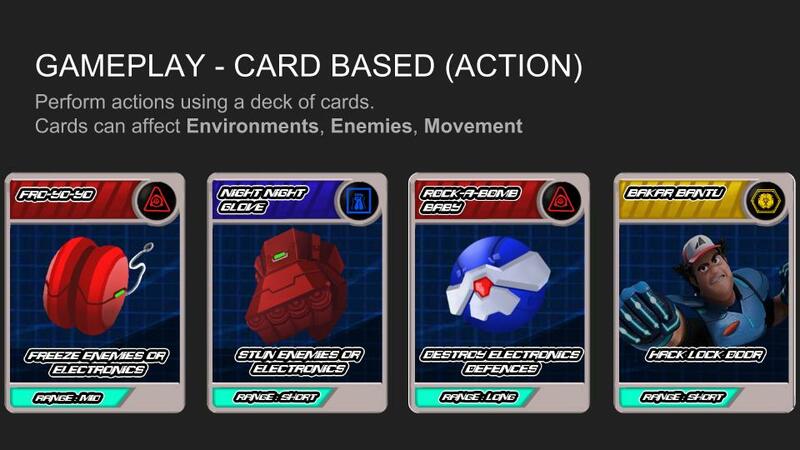 In the game, gadgets are represented by cards and you use them for your advantage. They either effect your movement, your special abilities and utilities. Having card types also represented the espionage factions of the show very well, and reading stats on cards is a lot more fun than reading a menu. Another method is downloadable content with codes which ties in with the TV show. The idea is that if a show introduces a new gadget, you can view the download code on the show or during commercials, which then unlocked a new gadget in the game. Alternatively, if you buy a merchandise, there might be a code inside as well to unlock premium content. The marketing potential in quite exponential, I imagine. My mistake was making it turn based, as mentioned by the judges. Growing up, I played many turn based games and I enjoyed the pacing of it because I don’t feel rushed. And I have to agree, kids these days prefer something more immediate and gratifying, rather than wait for something. They like the transmedia idea but felt the turn based is too boring. In the end, it is an invaluable experience and lesson and finally get to stretch my design muscles is a wonderful feeling. You can check out my full pitch in Google Docs here, or view the full slides here.